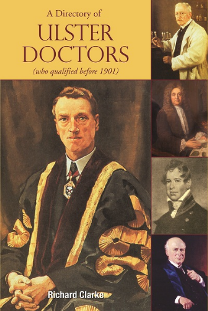 If you've got doctors in your family from the north of Ireland, a new two-volume book, A Directory of Ulster Doctors (who qualified before 1901), from Richard Clarke could be of interest. The north of Ireland has always produced a large number of doctors, not only for Ireland generally, but for the armed forces and for the wider world, and this directory lists nearly six thousand names. Each name comes with biographical notes, including details of parentage and dates of birth, marriage and death, and medical education and career. The information is derived from a wide variety of sources, both published and unpublished, and is set in the context of the development of the medical profession over several centuries. Published by the Ulster Historical Foundation, the hardback costs £50 and is available from BooksIreland.